With Biopics becoming the best beat at the box office it is reported that filmmaker Boney Kapoor will be paying his ode to Sultana Daku, the popular bandit of the pre independence era who was the Indian version of Robinhood. During the British era when the feudal system was plundering the poor Indians, Sultana Daku came to their rescue like a messiah. He looted the feudal landlords and the rich and helped the underprivileged. Sultana Daku had become such an annoyance to the British police that like mad dogs the British police hunted him but he would not be traced. Sultana Daku had become a thorn in the throat of the British. The media was blazed with his daring stories how he coned the British police. Sultana Daku hated the British so much that he had named his dog Rai Bahadur, while Sultana’s loyalty to Mother India can be gauged from the fact that he had named his horse, Chetak, similar to the name of freedom fighter Maharana Pratap’s horse. Eventually he was arrested by the British and hanged to death. What makes Sultana Daku’s story inspirational is that unlike other famed dacoits like Phoolan Devi and Nirbhay Gujjar who turned dacoits to avenge the humiliation that they suffered, Sultana took to gun to fight and protect the deprived and downtrodden. According to reports Boney Kapoor has acquired rights of the celebrated novel ‘The Confession Of Sultana Daku’ penned by Sujit Saraf's novel, that deals with story of Sultana Daku in detail. 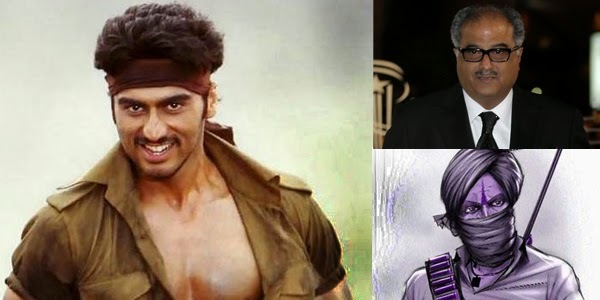 Insider’s claims after the success of TEVAR, GUNDAY and ISHAQZAADE, Boney Kapoor wishes to exploit the action image of his son Arjun Kapoor hence he has opted for an action thriller and what better than SULTANA DAKU. The character is tailor made for Arjun Kapoor taking into account his height, body and his flair for stunts. Is Virat Kohli’s Hooliganism Justified?